The new Pea Island Interim Bridge opened to one-lane traffic late Tuesday, with both lanes expected to open by the weekend. The exact opening date is slightly flexible, simply because the remaining construction tasks are weather dependent. 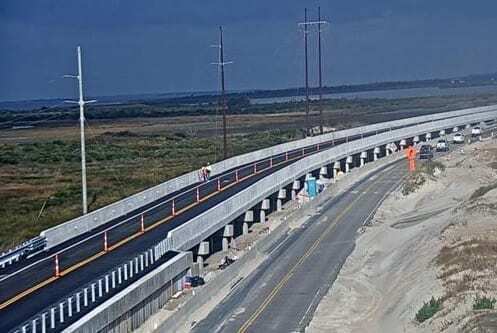 When two lane traffic has been established, the speed limit on the new Pea Island site will be 55 mph on either side of the bridge, and 45 mph on the bridge itself – a speedy upgrade from the old bridge, which had a 25 mph speed limit. The next big task after shifting traffic to the new structure will be to make the newly created road tie into N.C. Highway 12. “That means that with the curves that are there, we’ll need to shape them the right way for the speed limit,” said Hernandez. There will also be one last layer of asphalt applied to ensure a smooth and rideable surface. “It’s like applying that final coat of paint,” added Hernandez. In addition, there is still some remaining shoulder work on the horizon, which involves making sure the shoulders are smoothed and graded properly, and adding mulch and vegetation. Once traffic is starting to flow on the new structure, the former Pea Island Bridge – known in local circles as the “Lego Bridge” – will be torn down. The dismantling of the old Lego Bridge is slated to begin as early as this week. It had been hoped that the bridge would be open this past week, but the weather was a roadblock to completion. Good thing they did not build dune lines, they are a main factor causing erosion.